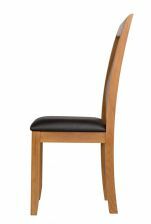 Westfield dining chair made from solid oak with a dark brown real leather seat pad. 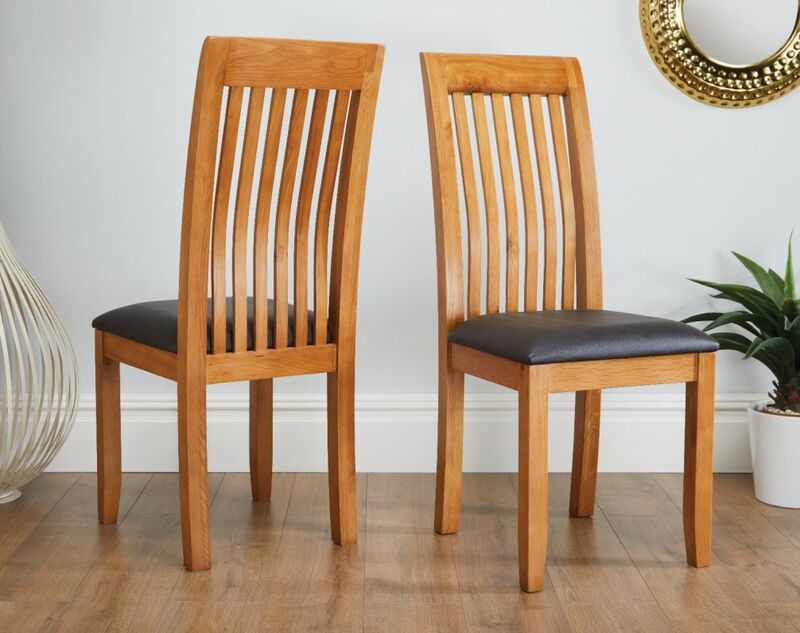 A new dining room chair design recently added to our selection made from solid American oak sourced from sustainable forests combined with a brown real leather seat pad. This winning design has been so popular in the past few months that as soon as we get new stock into our warehouse it sells out fast. Order quickly to avoid further delays if this design is of interest! Very lovely and comfortable chairs. Really match my new dining table. Look durable and will go for years. Very pleased with the product and delivery service provided. would recommend them with confidence and use them again in the future. 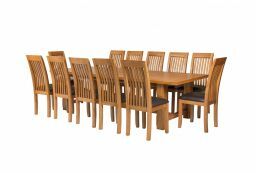 Hi I brought a set of 6 westfield soild oak chairs. Ordered them on line. Very very quick delivery. Delivered on exact time they said they would be delivered. Very pleased with them. Would definitely buy from this company again. During a visit to the Dartford store I was left alone to try out every chair in the shop until I was happy with one design (the Westfield). I ordered some and was told the lead time for the next delivery in my area and was three weeks away. I asked if it were possible to do something sooner as I had a houseful of family coming in ten days and they delivered the chairs in a week. Fantastic service. The chairs were perfect condition and really well made. I'm very happy with Top Furniture, I would shop there again and recommend them to anybody who wants top service and great quality. Well made, solid build and attractive. Seat well padded and firm. Lovely rich colour, well priced for such a beautifully made chair. The chairs are substantial and beautifully made. The leather on the seat pad is high quality and I will definitely be buying more things from Top furniture. It is definitely worth buying proper furniture not self assembly and the quality is top notch. Selected this model of chair after testing out many designs, and found they were the most comfortable. The back support is also very good which enables you to have a good posture when sitting at the table. The build quality is very good too. The chairs are delivered ready assembled and are packaged well. 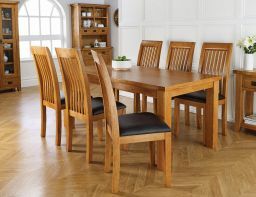 The style and colour is spot on lovely oak grain throughout well crafted chairs. Very pleased. Solid construction and enhances the kitchen. Well packed too. Very nice chair at an acceptable price, will certainly visit again now that we know where you are. Very happy with my purchase great quality more than happy. Quick and prompt delivery. Very impressed with every aspect of this order. Great communication, timely delivery and very pleased with the quality of the furniture. These chairs are beautifully made, thick solid legs and great support shaped back. The leather pad is comfortable ad well finished. Well worth the price. I had some doubts about buying chairs online as we couldn't try them but am absolutely delighted with these. They are a good match for our other furniture and very comfortable. 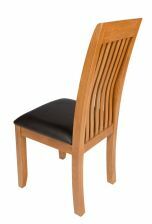 Fantastic quality dining chairs at a very reasonable price with free prompt delivery. Excellent service good quality product. The chairs are just what we wanted and more, the quality is outstanding and they match our table lovely couldn't have picked any better. Great chairs, very well made, top quality. I would recommend this company, for its fast service, and you receive what you ask for. Very very pleased with the look and price. Top quality product. Rock-solid, sturdy and beautiful. Real quality product. Very heavy. Chairs arrived yesterday as scheduled very pleased with them look good a match to our table and good quality. Would recommend for all round service and quality. Very pleased with these dining chairs. 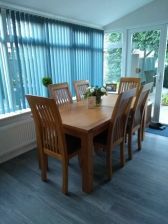 Excellent quality and they match our dining table perfectly. Hassle free delivery too. Beautiful solid chairs , classy , well made and comfortable, tried a few before we settled on these chairs and we are delighted with purchase . Good size seat and nice supportive backs. As an added bonus they were delivered promptly and courteously ....full marks Tops Furniture. Substantial and beautifully made. I am delighted with the chairs. Excellent service and delivery was exactly to the time that was stated. 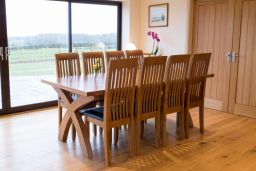 I am very happy with the quality of the product, and would not hesitate to recommend 'Topfurniture' to anyone looking to purchase great quality wooden furniture. Very pleased with the quality and finish of our new chairs. They look great and are comfortable. Prompt service and helpful delivery drivers. Look brilliant and goes well with my furniture. Very pleased with delivery process. Love these chairs. They look brilliant around the table. lovely solid chairs well worth the run out from nottingham to view chairs delivered with no problems a few days after.all in all a good buying experience,certainly would recommend to friends and family would buy from you again. They are lovely chairs , delivered 1 week after ordering , arrived perfect. Very sturdy chairs beautifully made. Are more solid than they appear on the picture. Very pleased with the purchase.